Are you looking for an escape from your daily routine and tiring schedules? Are you a travel freak who is deeply absorbed by Sean Penn drama 'In to the wild' or Ernest Che's Motorcycle diaries? Well, Coorg is your remedy then. Are you in for a Roadtrip From Bangalore to Coorg? For Bangaloreans, Coorg is a quick runaway. A weekend trip to Coorg, preferably by road, is one thing you really deserve. Coorg is compelling even if you stay far apart. Let's see what makes 'The Scotland of India' this alluring and why should it be there at the top of your bucket list. Coorg or Kodagu is an administrative district which spans across the Western Ghats of southwestern Karnataka. The place is known for it's coffee, people and geography. From monasteries to flora and fauna, Coorg has it all for a travel lover. Coorg is the favourite hideout for many Bangaloreans. A weekend ride would ensure you that your energy bar has hit the ceiling once you reach back from Coorg. The Bangalore- Coorg road which stretches from Bangalore to Madikeri via Hassan on the NH-48 is said to be one of the most favourite highways for bikers in the country. It would be an endearing and everlasting experience if you hit the road in a bike. The scenic and obstacle free panoramic views is a treat for the pair of eyes. The Ghost-grey fog awaits you on the entrance to Coorg and therefore do reach Madikeri before the sunset. PLACES TO LOOK OUT FOR! If you are an adventure seeker, an early morning ride to Mandalpatti is all it takes to rejuvenate you. Around 30 km from Madikeri town, Mandalpatti hills are misty,cold, windy and sometimes rainy. You require a 4 wheel drive to ascend the hill, which is available on rent. . But if you wouldn't mind a bumpy and adventurous off-ride, bikes are the best companions. . The off-road trail upward and the mist covered greenery in the periphery will definitely get you high. Once you reach the end of the small trek, the place 'll leave you spellbound. No wonder Coorg is known as 'The Scotland of India'. 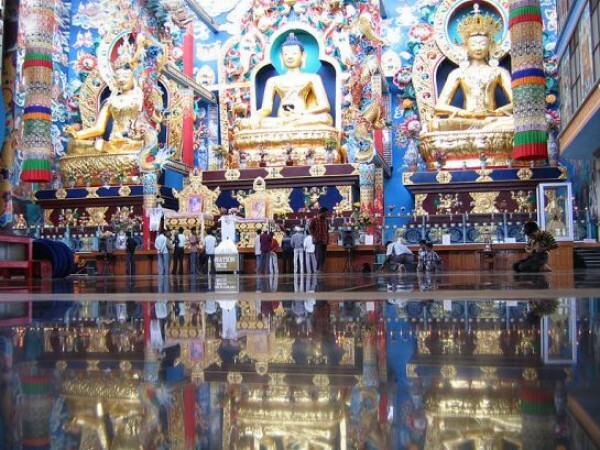 The Tibetan settlement at Bylakuppe is the second largest in the world, outside Tibet. Among the different monasteries in Bylakuppe, the Namdroling Monastery or Golden temple is the largest and the most famous one. The 40 ft tall golden Buddha statues are the main attractions here. You could also make a tour of Buddhism and Tibetan/ Lama culture here. Nestled near Madikeri, Abbey is a 70 ft high waterfalls in between the Mandalpatti - Madikeri route. Iruppu is another famous waterfall in Coorg. It is more a pilgrimage spot because of the presence of the Rameshwara temple, a famous Shiva temple. Mallalli falls, one of the largest and highest waterfall in Coorg, and Chelavara falls are the other famous waterfalls in Coorg. It is one of the most visited tourist spot in Coorg. Raja's seat is a seasonal garden of flowers and artificial fountains where the Kings of Coorg used to relax watching the setting sun with their queens. The array of pink and orange colours sprayed on the canvas of sky by the setting sun is a splendour to watch. Who wouldn't dream of such a Royal sunset? Kaveri Nisargadhama is an island formed by the river Kaveri, with thick bamboo groves, teak trees and sandalwoods. It is accessible by a hanging rope bridge. It consists of a deer and rabbit park along with a children's playground. Elephant riding and boating are famous here. Aforest department run guest house and tree top bamboo cottages are available for stay. The Dubare elephant camp is another major attraction in Coorg. There are opportunities for trekking, elephant riding, fishing and river rafting in Dubare. Go and get impressed by the sheer magnanimity of the tuskers and want to try your hands on how these cute giants bathe? Then, this is your chance. Nagarhole National park is a tiger reserve in Coorg. The park is rich in flora and fauna, valleys and hills. The park is great for a drive through. Brahmagiri Hill is another scenic tourist attraction in Coorg.whichoffers one of the best view points and is a hiding place for rich wildlife. Not just hedonic holiday makers, pious devotees are also attracted to Coorg for its temples. The famous Omkareshwara and Bagamandala temples are the major temples of Coorg . During the exotic monsoon showers, which Coorg is famous for, water rafting and various other water sport activities are held here. So what are you thinking about? Pack your bags and go for a relishing journey through the heart of Coorg, which is undoubtedly the India's answer to Scotland. If you are a non-vegetarian, don't forget to taste the mouth watering pork dishes which is the main delicacy of this region.